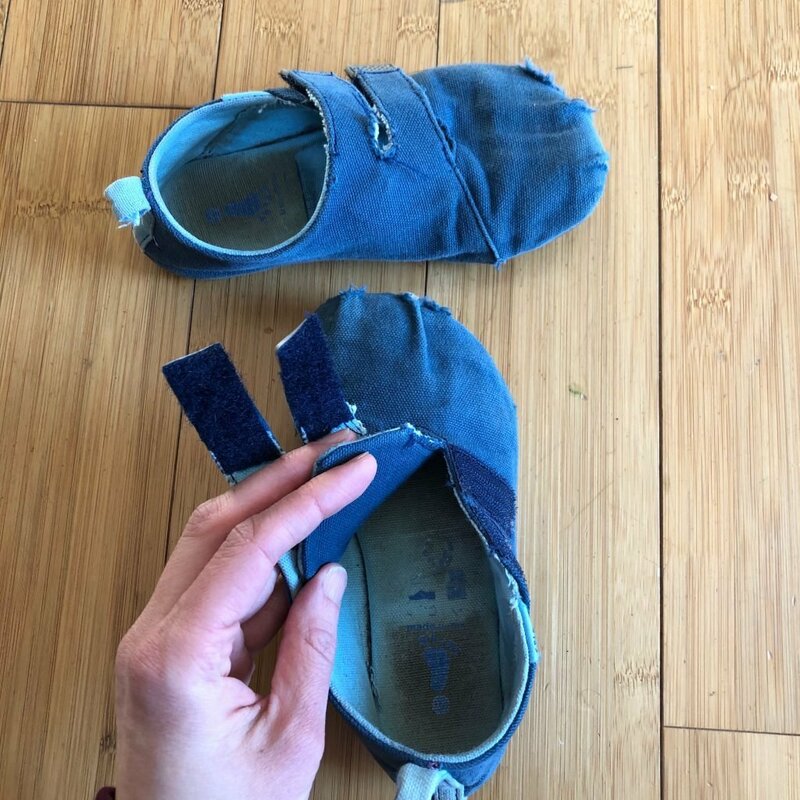 I was super excited to hear about Splay Athletic’s kickstarter for affordable kid’s shoes, since there are not a lot of options out there for kids right now. 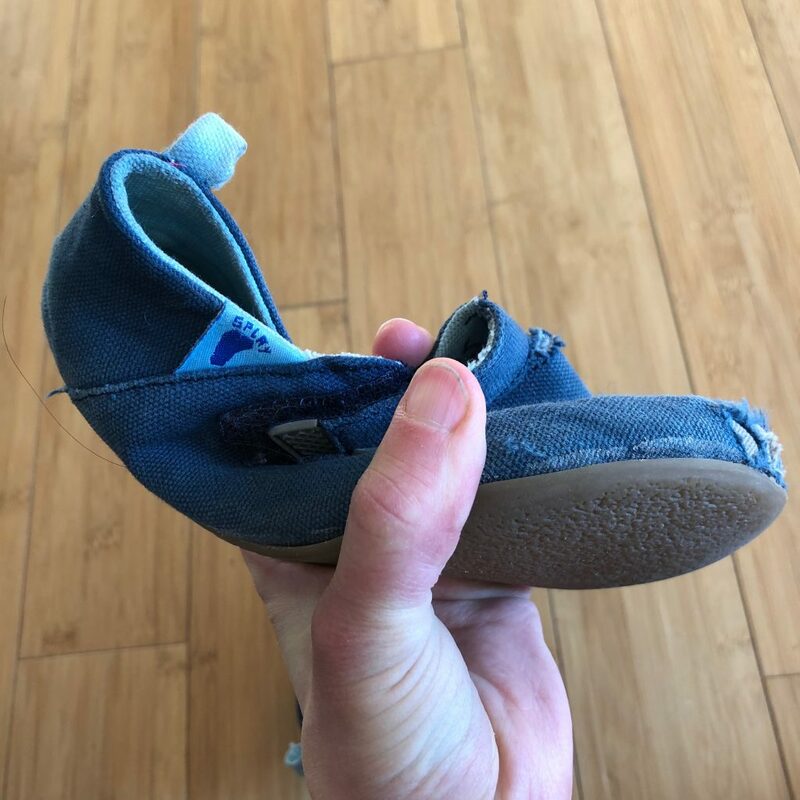 It is so hard to stomach the cost of expensive minimalist shoes your kid will wear for 6 months and then either grow out of or bust through. At the price point of $35 for one pair, and the fact that they come in blue (a requirement in our house! ), I did not hesitate to place my order. If you buy two pairs there is a 10% discount, making them $31.50 each. Shipping is $2.99, and they have free returns and exchanges (provided you use the size guide to choose your size and they still don’t fit). 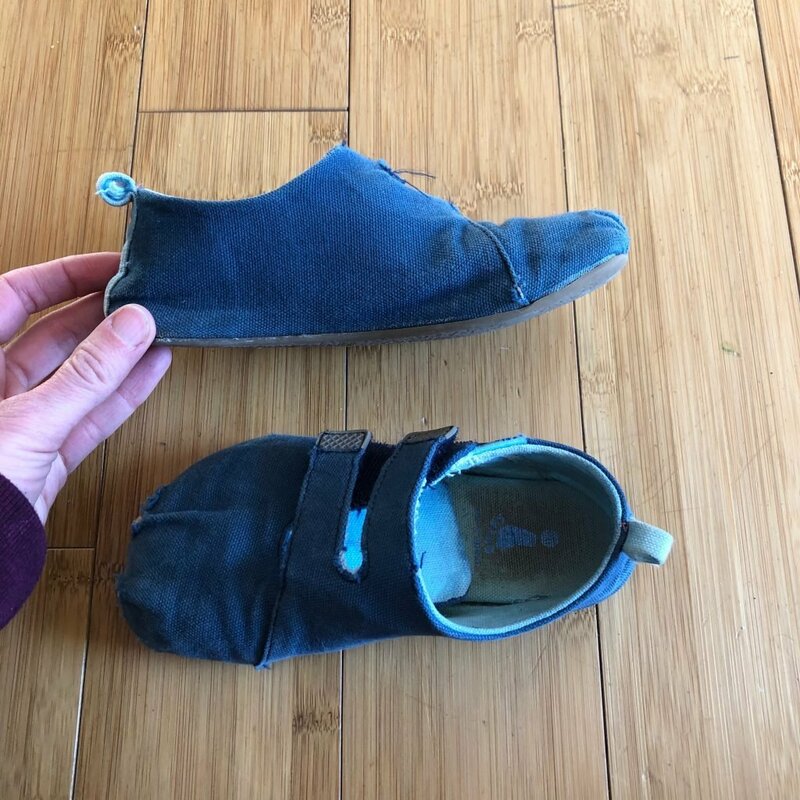 Vivobarefoot’s kid shoes range from $75-$100 for comparable styles, and Soft Stars are $55-$75, for comparison. Probably the most enticing part of Splay’s shoes is that they stay the same price even in big kid’s sizes. 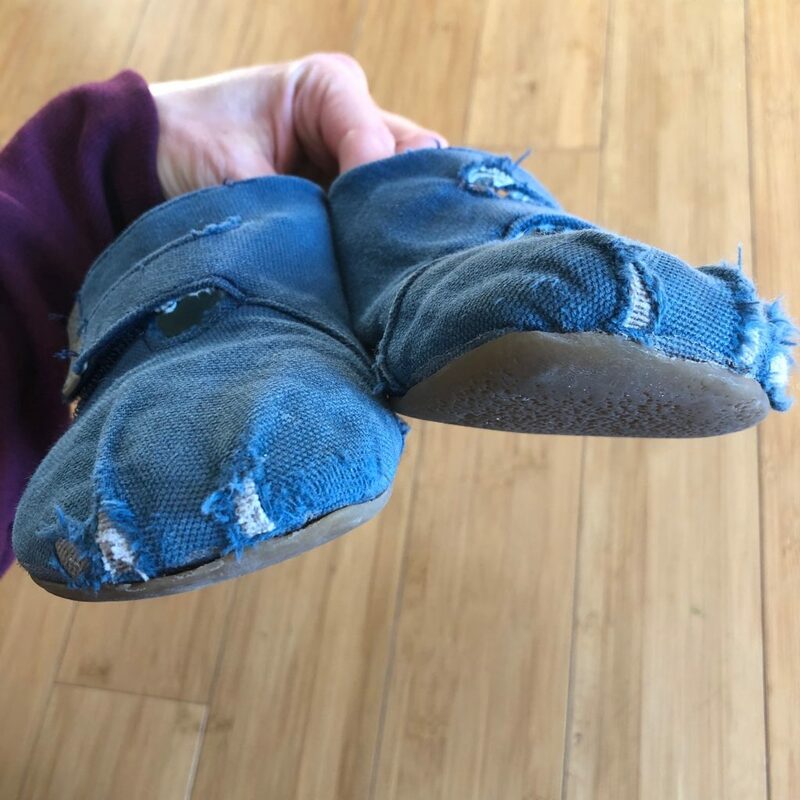 Big kids shoes are especially hard to find flat and flexible, and they become very expensive very quickly. When choosing a size, I followed their size guide and bought according to my son’s measurements. They came and fit perfectly. 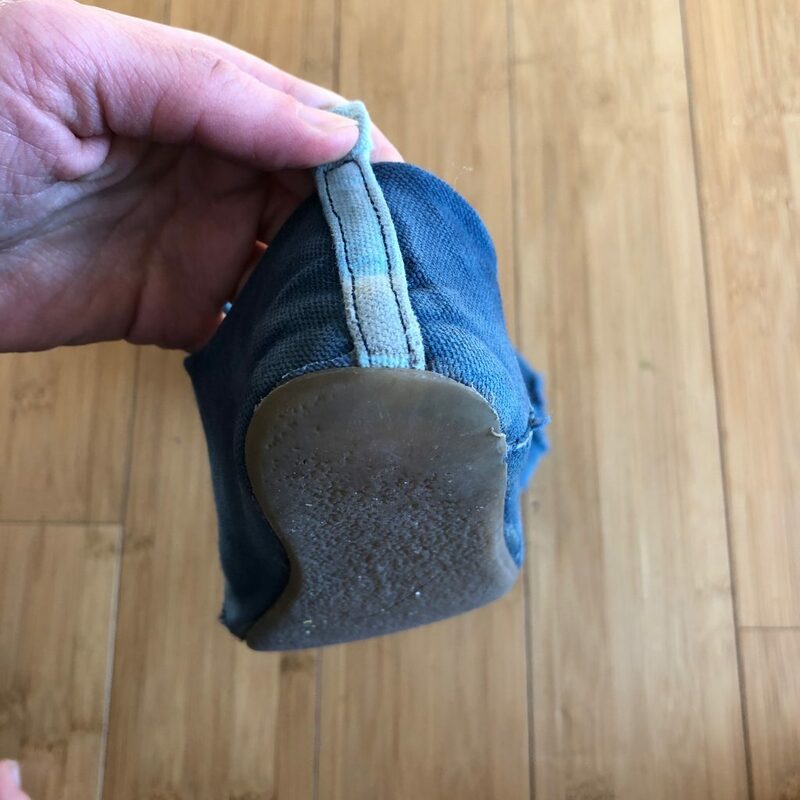 It seems many people who ordered their kids normal size but did not measure according to Splay’s directions were disappointed with the size they received, so definitely use their size guide. These are made entirely out of 100% cotton canvas. 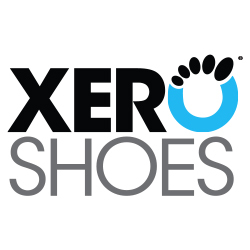 They’re lightweight, feel good on the skin and can easily be worn without socks. 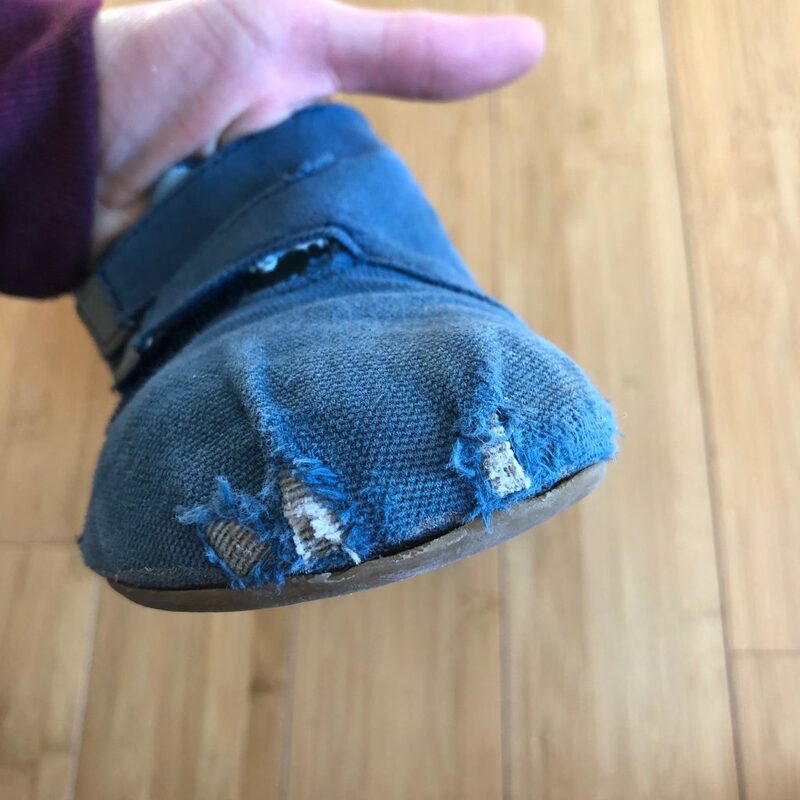 After a few months of wear I noticed the blue exterior was wearing away and I thought for sure there would be holes. I was surprised to see that the material underneath the blue is actually pretty sturdy and doesn’t have any holes. Still, it’s a little unsightly to have the exterior of the shoe basically coming off. 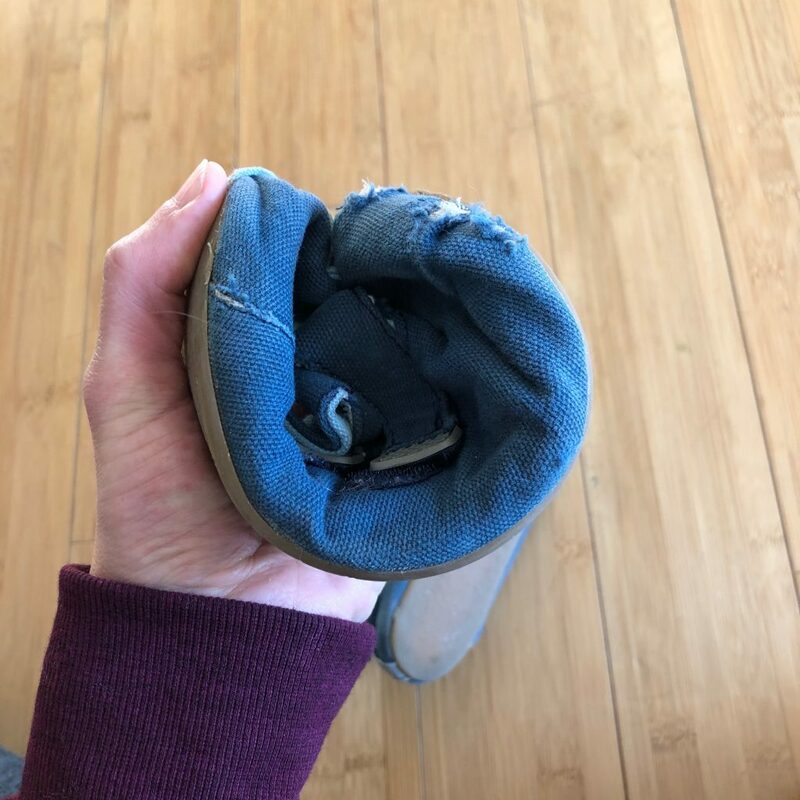 My son had one other pair of shoes he wears in addition to these, so they don’t get used every single day, but are used in all terrains and weather. The material does stain which, when combined with the holes in the blue, makes them look extra ratty. 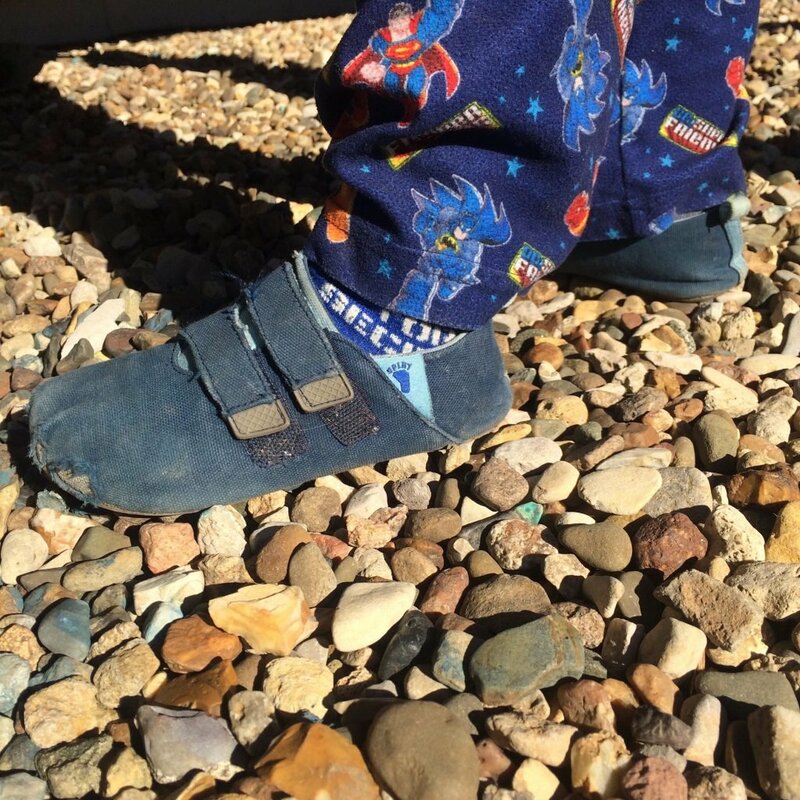 Personally, I don’t really care what my son’s shoes look like as long as he likes them and they function as intended (they’re shoes, and he’s a kid, and I don’t think he’s ever been anywhere fancy in his life!). That being said, these are definitely play shoes. 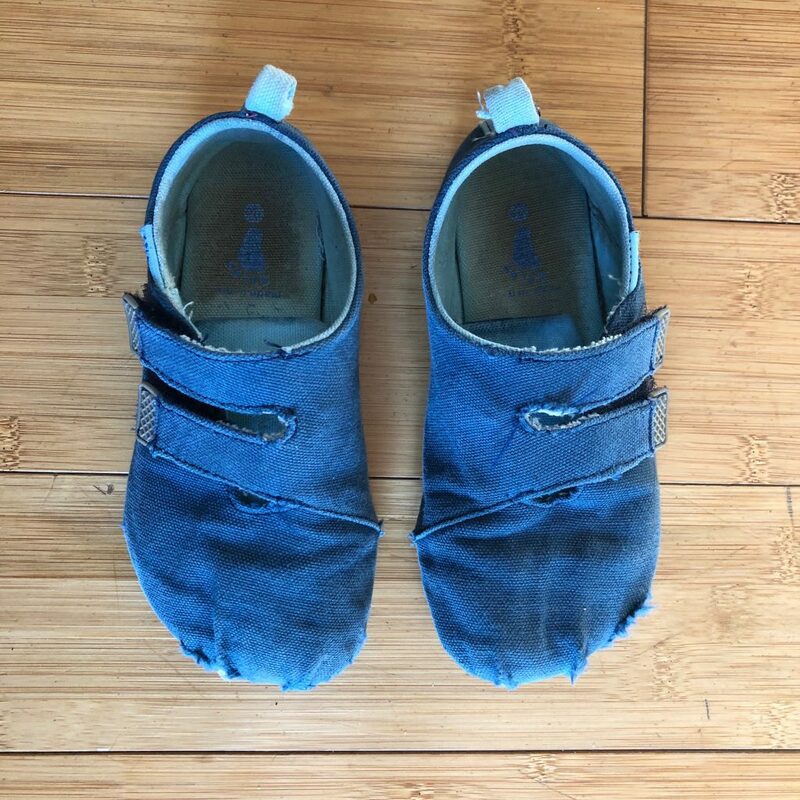 I washed them once on gentle and it did cause some fraying of the straps (they warn against this on their site), but none of the stains came out. For kids, these are very functional shoes. 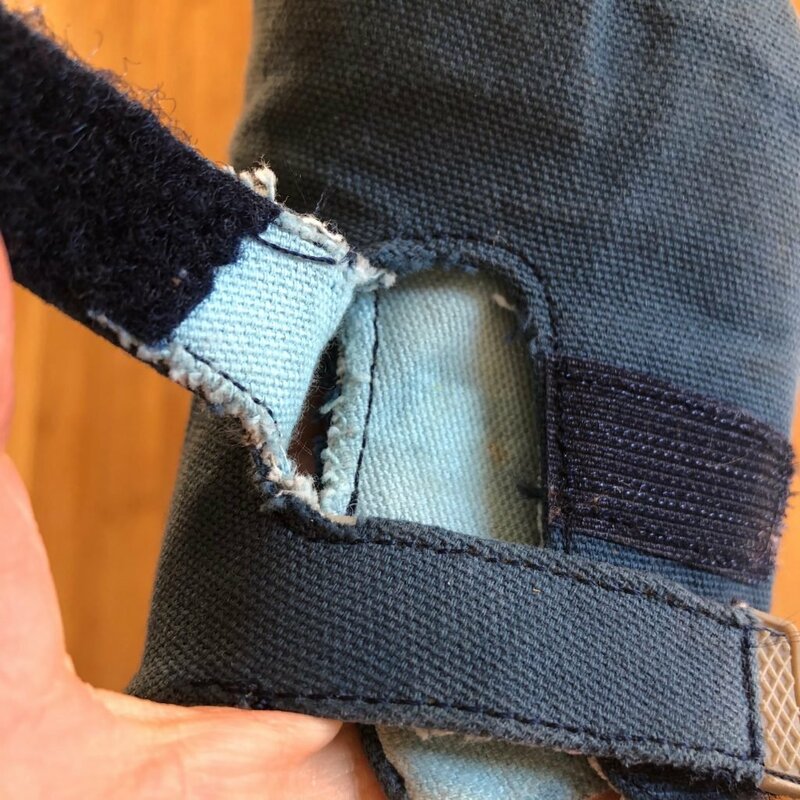 They’re easy to get on and off, they’re lightweight, they can get wet without being ruined, and the generous velcro straps make them quite adjustable. 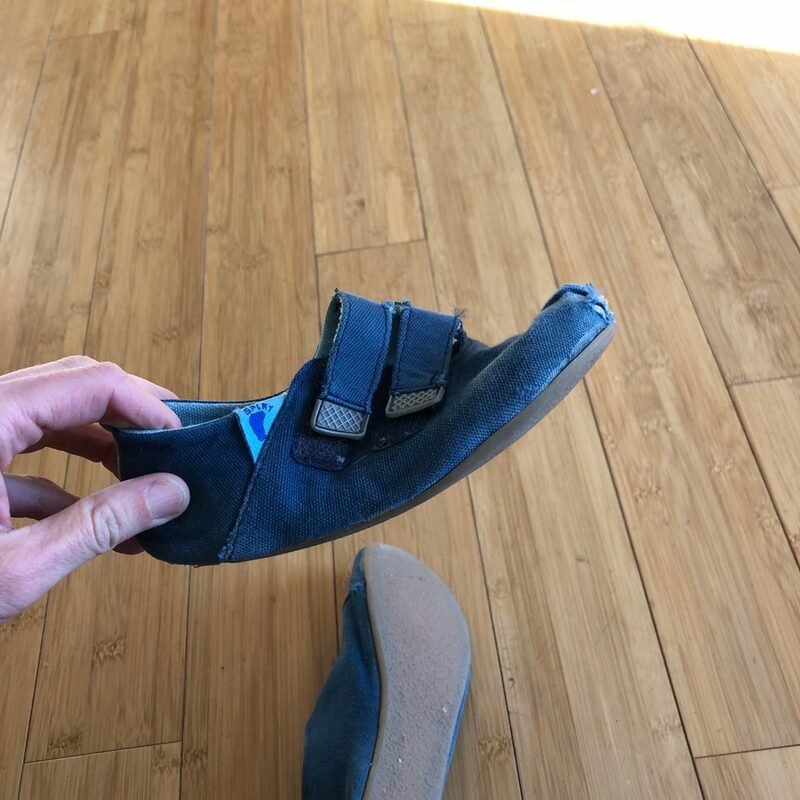 I like that these are shaped to fit wide and narrow feet (generous velcro straps), and the toe box is foot shaped. 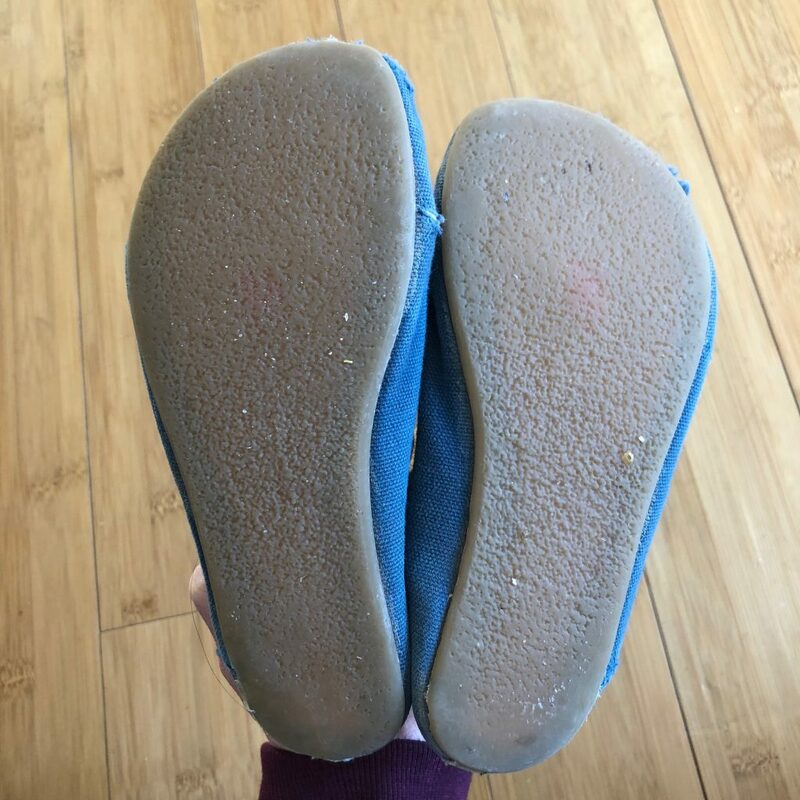 The sole, while flexible, leaves something to be desired in my mind. It’s pretty stiff (for a barefoot shoe) and difficult to bend. See my white and red thumb? It was difficult to get them to bend this way with one hand. After contorting them and letting go they kept their shape until I pushed them back down. Unfortunately, only their aqua and pink colors have all sizes in stock ( as of the time of this writing), while the gray and navy blue are mostly sold out. I expect them to get a restock, but don’t know for sure. I e-mailed them a week ago to ask them some questions (including when they were planning on getting more inventory) and have not heard back yet. I know starting a small business is crazy, and I am sure they have been going through growing pains in their first year of business which hopefully will smooth over with time. I’d like to see their sole material improved, and of course more sizes and colors available for purchase. But because of their price point I do plan on ordering from Splay Athletics again and will definitely be keeping them on my radar as they make adjustments and grow. I agree with everything you wrote. Those spots in the toe have now worn completely through. Me daughter loves them and has worn them almost everyone she puts on shoes since we got them 6 months ago. I am very concerned that the company is not surviving, but I really hope they pull through as well love to keep buying them. I hope so too! They did reach out to me saying that they’re working on addressing several of the concerns people are having and will update me, but I haven’t heard anything yet!